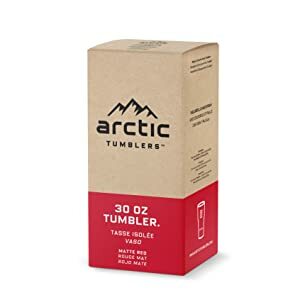 Sold by ARCTIC TUMBLERS and Fulfilled by Amazon. Gift-wrap available. 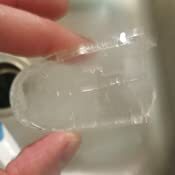 VACUUM INSULATION | Keeps drinks hot for up to 6 hours and keeps ice for up to 24 hours! Pour hot water into the tumbler and it will still be cool to touch on the outside. BUILT STRONG & SAFE | The body of the tumbler is made with HYPOALLERGENIC 18/8 grade stainless steel, the same quality as found in professional kitchens. 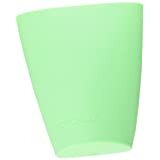 Our Arctic Tumblers lid is made from Tritan plastic, and contains absolutely NO BPA OR BPS! SWEAT FREE CONSTRUCTION | Never use a coaster again while our vacuum insulation keeps your tumbler sweat-free on the outside, no matter what temperature your drink is. Plus the attractive powder coat finish will give you a good grip at all times. CUP HOLDER FRIENDLY | All Arctic Tumblers are made with a 3 inch (7.6 cm) base, and fit nearly any cup holder or hand with ease. Go ahead - measure your own! SATISFACTION GUARANTEE | Your satisfaction is our top priority. If our tumbler doesn’t turn out to be everything you thought it would be, we will give you a 100% refund. As an FBA (Fulfilled By Amazon) seller, our return policy is backed by Amazon. 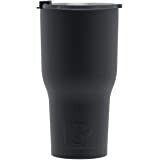 The raised ridges make it easy to keep a grip on the filled tumbler too. 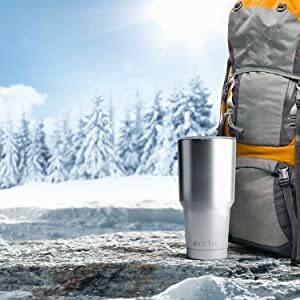 — Martha V.
Arctic Tumbler 30 Oz Cup with Compatible Lid - Double Wall Vacuum Insulated - Premium Insulated Thermos Cooler- Made to Keep Coffee HOT & Iced Tea COLD! 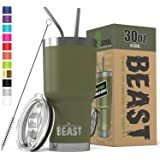 This tumbler is great for teachers, professionals, students, kids, travelers, nurses, health care professionals, gifts or presents, the outdoors, and virtually any adventure you could dream up! 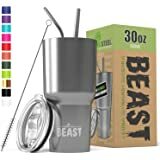 For home, school, office, gym, sports, indoor and outdoor use, on the road, travel, hiking or hunting trip to the mountain, or a trip to the beach! 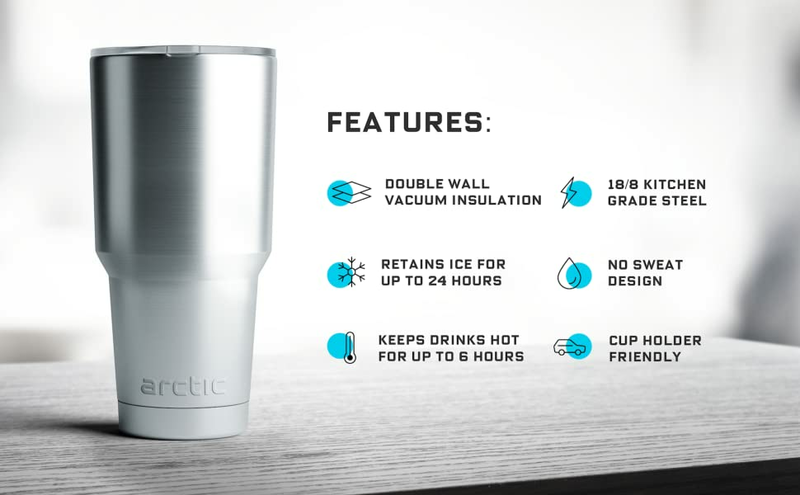 Why choose Arctic Tumbler? We're glad you asked. GREAT VALUE FOR THE MONEY – Slim cup holder friendly design and splash and leak proof sliding lid! 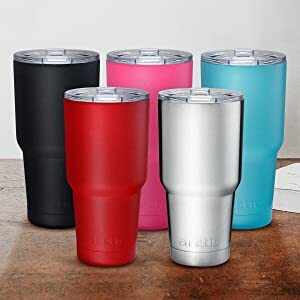 NO SWEAT NON-SLIP EASY GRIP AND LEAKPROOF – Carry your favorite drinks in this reusable portable container! 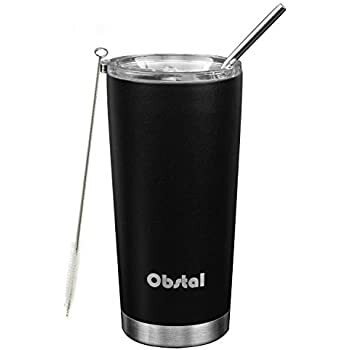 MAXIMUM TEMPERATURE RETENTION – This dual purpose innovation drinkware keeps your drinks, water and other liquids piping hot or icy cold! EXTREME DURABILITY – Made from kitchen grade 18/8 corrosion resistant and rust free stainless steel - same as you'd find in professional kitchens! USE WITH OTHER BEVERAGES – Your favorite espresso, coffee, hot chocolate, orange juice, lemonade, soda, smoothie, or even beer! BPA FREE – Our lids are made with Tritan plastic that contains no BPA or BPS! SEAMLESS FINISH FOR EASY CLEANING – Our laser welded, vacuum-sealed tumblers have no corners, making them extremely easy to clean! 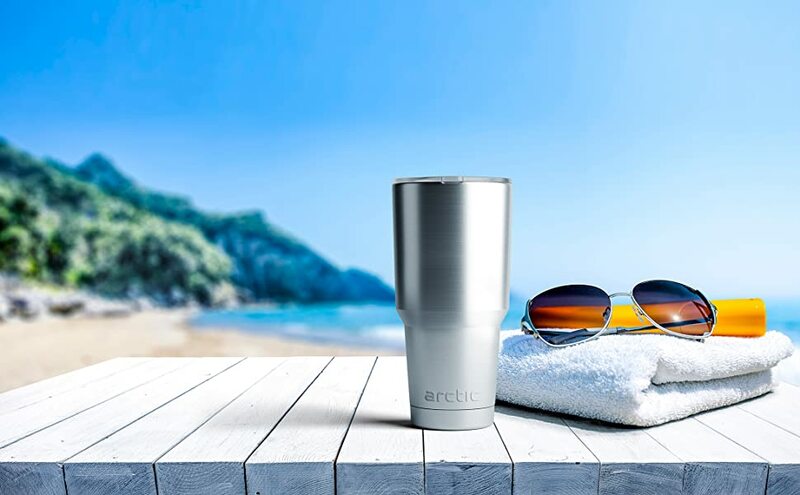 ALL CHILL – If you're not happy with your Arctic Tumbler, we're not happy - let us know and we'll make it right! At this level of affordability you can get multiple colors for less than our competitors. Look good while staying hydrated! Comes with lid, cleaner, straw, and cup. Equipped with a durable body, double-walled construction, lid, straw, and cleaner, the Tumbler set comes with everything for the go. The perfect addition to any travel bag, take the Tumbler to any extreme temperatures and experience the difference. 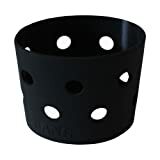 Fill with ice cold water or hot tea. The vacuum insulation will keep drinks hot for up to 6 hours and keeps ice for up to 24 hours! The body of the tumbler is made with HYPOALLERGENIC 18/8 grade stainless steel, the same quality as found in professional kitchens. 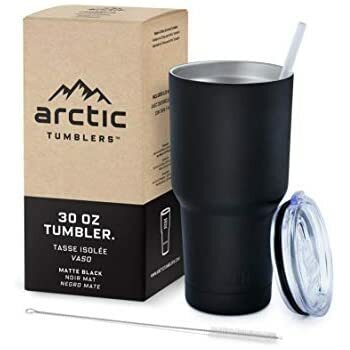 All Arctic Tumblers are made with a 3 inch (7.6 cm) base, and fit nearly any cup holder or hand with ease. Go ahead - measure your own! 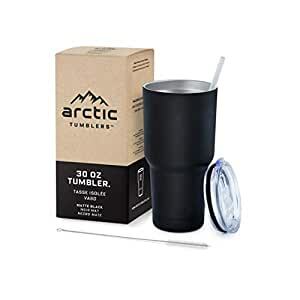 Stop drinking out of an ordinary glass and start drinking straight from an Arctic Tumbler! 5.0 out of 5 starsCan't beat the price! Granted I have only had this cup for a day, but I did compare it to my Yeti cup of the same size. Upon first inspection, I did notice that is was lighter than the Yeti and the lid seal does not appear to be the same quality as the Yeti. I put the same amount of ice in each cup and let them sit overnight. Upon inspection the next day, both appeared to still have the same amount of ice. I then dumped the water out of each into a measuring cup and both had about 1/2 cup of water in them. Considering the price of the Yeti is twice as much as the Arctic, I have to give the Arctic 5 stars at this time. I will adjust my rating should I experience issues down the road. Ok, so I was a skeptic. I ordered the Arctic tumbler hoping it would be "as advertised" and really keep my iced tea cold. Call me doubtful, but I simply didn't believe all the hype. Now, I must admit I was wrong! Today, I left my iced tea (8 hours after pouring it in the tumbler, with ice) in my car, in the direct sunlight for 90 minutes. No way I would come out to find a cold drink, let alone any ice...But there it was, still cold, with ice still in it. The tumbler is worth every penny. (No, I didn't receive any discount or money for the review). 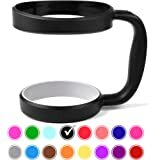 I bought this to use for larger cups of coffee. My previous tumbler would not hold more than 8 oz of coffee plus creamer. This one does a great job of keeping the coffee hot (with the lid on). I considered getting a handle at the same time that I ordered the tumbler, but I'm glad I didn't. I don't think a handle is necessary. I have not tried it with cold beverages yet. UPDATE 01/31/19: I had an issue with the lid. 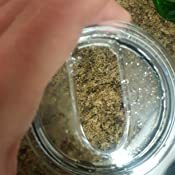 For no apparent reason (it had not been dropped or otherwise impacted or put in the dishwasher) the lid began to appear etched and started developing cracks. 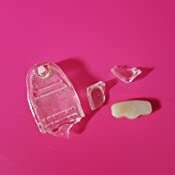 The slider eventually cracked and came apart altogether. While I was disappointed with the lid, I am very satisfied with the customer service from Arctic. I emailed the company and received a response the next day, apologizing and stating that a replacement was being sent. 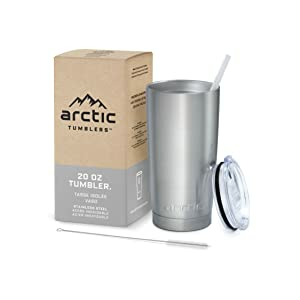 I must admit I thought I was buying an rtic tumbler that came with a lid so I was surprised to see that it was Artic. But the reviews were as good as for the other so I decided to give it a try. I have been using it for three days and it has performed admirably. It keeps ice and it does not sweat which was the problem with my Tervis tumbler. It was terrible about sweating and did not keep ice. 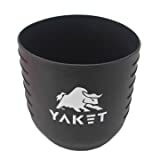 I think this stands up well against Yeti and rtic and is about half the cost of Yeti and is a little bit less than rtic. I like that it came with its own lid. Overall, I am very pleased with this product. 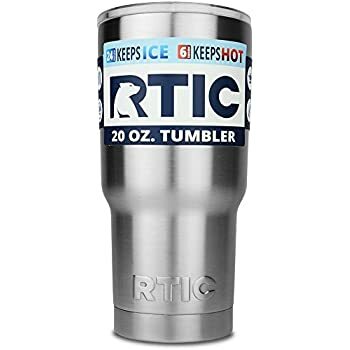 The RTIC Tumbler is everything we expected. The only criticism is the weight but that is understandable with the construction to make it cold lnger and warm longer. As advertised the cold beverages remain cold for extended periods, in fact some small ice cubes remained in the cup over night. Very happy with the lid configurations for the straw setups and the straws. The hot beverages were as advertised. My coffee remains steaming hot for at least an hour but remains Hot/warm for up to two hours, then it cools to just warm approaching three hours but warm enough to satisfy me. The cups both 20 oz and 30 oz fit perfectly in car cup holders. 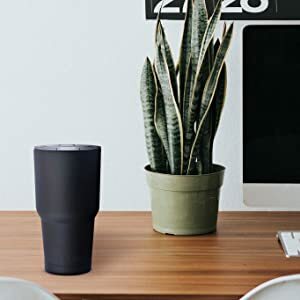 The 30oz cup is stable enough to use on tables but it's weight and height can make it easy to tip if it is bumped accidentally. 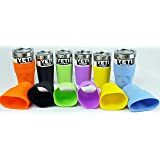 Compared to the Yetti's cost and performance the RTIC cups were well worth the purchase. 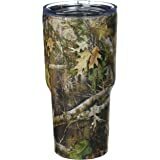 We have tried Walmarts Ozark Trail cups and like the RTICs best. 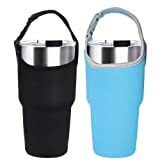 I have both the 20 oz for coffee and hot tea and 30 oz for cold beverages in travel and home use. First I have to say I did not perform a side-by-side comparison of the YETI and ARCTIC tumblers. My wife had a YETI and my ARCTIC seems to stay just as cold, just as long and looks worlds better doing it. The lid goes on tight and snug. 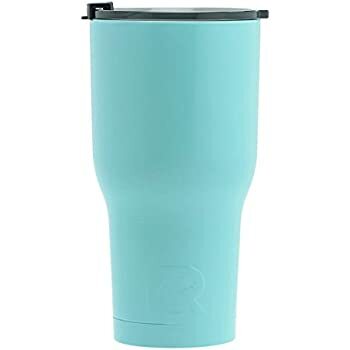 I use my ARCTIC for keeping water or tea close by all day long so it's gotten plenty of use in just the few days I've had it. I'm really happy with it and would recommend it without hesitation. I'm verrrry disappointed with my tumbler. While it keeps drinks very hot for a long while and keeps drinks cold even longer, I have had my tumbler for less than a month and the lid has cracked. The tumbler was not dropped or misused. I believe the lid was faulty and of poor quality. 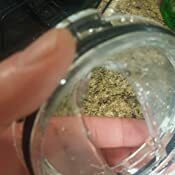 I'm not sure if others have found this maybe it was a "bad batch" but unfortunately this has happened to my BRAND NEW arctic 30oz tumbler lid and it's upsetting. What a waste of money! 1.0 out of 5 starsGreat for warm beer lovers! This cup is going back! Sadly, this failed horribly at keeping drinks cold. 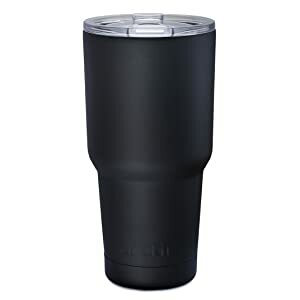 The outside would actually start swearing when filled with a cold drink. I purchased it to take on vacation & its only redeeming quality was that it held more that the itty bitty cups that the resort had. And the straw which allowed me to sip my rapidly warming beer whilst lounging. Oh well. That’s what I get for trying to be thrifty, so consider yourself warned! Should have spent the money on a Hyrdoflask or Yeti.